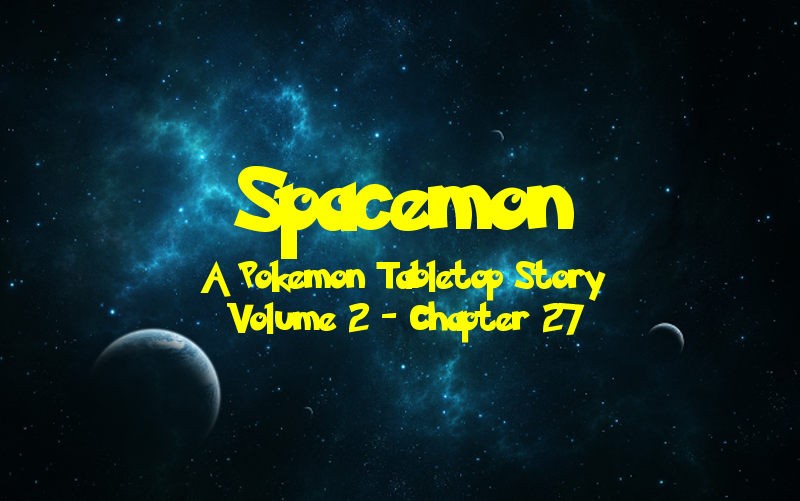 Welcome to the exciting conclusion of the second volume of Spacemon, the tale of a Pokemon TRPG campaign! It is a sci-fi space epic played using the Pokemon Tabletop United (PTU) system and GMed by fellow TAY author DragonStorm247. You can get caught up on our previous adventures here! The crew of the UAS Helix and their friends in the Red Suns confronted the enigmatic Mr. Silver. Mr. Silver claimed his plans were too far along for anyone to stop and revealed his true form: a pure digital being, counterpart to the Gardener. Unlike Shane, however, Mr. Silver is whole and free of Human reconstruction. The AI revealed that he and Shane were the product of a powerful ancient civilization, tasked with seeding the Galaxy with life and then harvesting it to bring forth the next generation. After hearing enough, Arlon used the cyber-weapon the team had acquired at the Galactic Governance Conference to break into Mr. Silver’s network and stole a bunch of data. After analyzing the data, the team discovered a set of coordinates they believed to be the location of Mr. Silver’s operations. The Helix and the Corsair met up with a Federation fleet at the coordinates and boarded the small space station at the location. Inside, the team discovered a small tram leading into a miniature warp gate. With only enough room in the tram for five, the crew of the Helix head into the unknown, unsure of what to expect on the other side. The tram emerges from the warp gate on the other side, and grinds to halt. The doors slide open and the crew steps out of the tram onto the platform. A few crates dot the room and several bodies of Federation marines lie scattered on the floor. Three remain alive; two leaning against the crate nearest the tram, the other propped against the wall. “We should just finish them off,” H says in regard to the affected soldiers. He un-slings his Pokeball cannon and prepares to fire. “We’re here to help you,” Dmitri tells him. He helps the marine to lean up against the crate again, then begins to reach out with his aura. Dmitri feels the dark influence all around him. He pushes out against it and touches his crewmates’ auras. He continues pushing against the influence, driving it back and expanding his protective aura around them as well. He continues to expand, and touches the marines. The influence already has a hold on them, but Dmitri manages to ease the pressure a bit and prevent them from getting any worse. Shane walks up to Alex and helps her pull the man up. “I’m sure your commander would like to know you’re okay,” he tells the soldier as he’s pulled to his feet. The three marines pick themselves up and make their way to the tram. The crew sends them on their way and watches as the tram slides back through the warp gate. “Alright, let us proceed!” H shouts as he begins walking toward the door on the left. Once it seems like enough time has passed for the marines to get off the tram, Morgan walks over to the console and presses the call button. A few moments later, the now-empty tram emerges from the warp gate and comes to a stop. “There, can we proceed now?” H asks. The lights flicker a bit as the crew moves through the door into a narrow corridor. They press onward and come to a closed door at the other end. H walks up to the door and tries to push the door open. When that fails, he attempts to pull it open. “You have to press the button on the console, you idiot,” Alex tells him as she walks over to the console next to the door. She presses the button and the door begins to whir. It sparks a couple times and eventually slides open, though not very smoothly at all. The crew steps into the dimly lit room, which appears to be some sort of living quarters. Several beds line the walls on one side and in one corner there is a small kitchenette and a table. A viewport looks out into a dense red nebula. Broken bits of pipes and wires are scattered across the floor and a dead Federation marine lies slumped in the corner, a blood smear on the wall. A pair of damaged Genesect lie on the floor; one mangled, twisted, and heavily damaged, the other intact, eyes flickering on and off. Dmitri pulls out a Great Ball and throws it at the badly damaged Genesect. Unfortunately, the capture fails and the Pokemon emerges. It’s eyes start to flicker a bit and sparks fly out from its mangled form. While they wait for H, the rest of the crew searches through the personal footlockers near each bed and they find some useful items. “What happened here?” Morgan asks aloud, as she looks around at the badly damaged room. Alex walks over to a computer console in the room and manages to pull up some information on the station. “Hey, guys, I found a map,” she announces to her crewmates. She downloads the map to her Pokedex, then sends it to the others. “Nice work,” Shane tells her. The map shows that the station is symmetrical. Two corridors lead out from the tram platform into two rooms. One of which the crew is currently standing in. Two more corridors lead out from the side rooms and meet at the opposite end of the station from the tram at the entrance to a room at the center of the facility. “Whatever we’re looking for is probably in that central room,” Morgan says to the others. “I bet you’re right,” Shane agrees. When H returns, the crew moves on into the next corridor. They pass by several even more badly damaged Genesect and arrive at a large security door leading to the central room. Alex approaches the door and attempts to hack it open. “This door is locked down pretty tight,” she tells her crewmates. “Can you open it?” Morgan asks her. “But what about air?” Shane asks. “That’s what this is for.” H pulls out a vial of the oxygenation solution the crew used on Messina and injects himself with it. Once the others clear out, H and Shane approach the door to the breached room. A warning light flashes on the door and it refuses to open. Shane hacks into it and manages to get it to open. The air in the corridor rushes past them as it is sucked out into space. A large breach in the hull of the station is what immediately draws their attention. On the far end of the room, a third Genesect lies on the floor, severed in half by the emergency blast doors that presumably closed when the hull was breached. Shane then notices a set of consoles along the wall and motions H over to them. H checks one of the consoles and finds controls for life support and other such functions. Shane checks one of the other two and finds a series of badly degraded video logs from the scientists who worked at this facility. He takes a brief glance at one, then downloads what he can salvage. He then checks the final console and finds the security override. Before he presses the button, Shane checks the security cameras just to be safe. Through the horribly flickering video feed, he sees what looks to be some sort of lab. Some objects line the walls, but he can’t really make out what they are. He also notices what look to be another dead body lying on the ground. However, there doesn’t appear to be any immediate danger, so he presses the security override. He and H then return to the corridor and seal the door behind them. Shane pulls out his Pokedex and brings the logs up. “The console was pretty badly damaged,” he explains. “I only managed to find three that were still intact.” The first is dated a few years old while the other two are much more recent. The second is from the previous month and the third is from only a couple weeks ago. Shane selects the first and it begins to play. Large metal and glass pods with people inside of them line the walls of the laboratory. The camera pans to the door to reveal a raging Gyarados inside a cage being wheeled in. The sight of the confined Pokemon pains Alex, but it only gets worse. The scientists subdue the Gyarados, then bring it out of the cage. While it still lives, they slice it open—a living dissection. They reduce its innards to goo and pump it through tubes, injecting it into one of the pods. Alex looks away in disgust. Flashes and metallic sounds fill the air as the scientists conduct their experiment. The footage continues on, showing more horrific experiments being conducted on both Pokemon and the Humans in the pods. Different procedures, different means of dissection and injection, different chemical agents. Shane shuts the recording off, thoroughly disgusted by what he’s seen. Alex falls to her knees. She places her hands on the floor to brace herself as her insides clench up and she begins to vomit. “Why?” she manages to sputter out. “But- but, this,” Shane objects. “This is murder!” Alex screams at H as tears drip from her eyes into the puddle of her own vomit on the floor. “This is worse than murder!” Morgan walks over to the girl and places a comforting hand on her shoulder as Shane plays the next video. It starts off a bit garbled, but it eventually comes into focus. “We received new tissue samples from our benefactor a week ago,” the head scientist says. “Preliminary results seem very promising.” Several scientists gather around another pod as they begin preparations for another procedure. The camera zooms in on the pod, revealing the subject in the tube to be one of the clones used in Armstrong’s experiments. “Phase one: introduce the nano-” The video cuts out for a moment as it is badly degraded. “Phase Four successful. We will begin the next stage of the project,” the head scientist announces excitedly when the video cuts back in. A bright glow emanates from the pod, making it impossible to see inside. The video ends. Shane glances over at H, then silently begins the next video log. Genesect pour into the facility through the warp gate, and many more swarm around the outside. They move through from room to room, slaughtering the scientists as they go. One busts through the hull from the outside into the administrative room, slamming into the door. The blast door slams down and servers it in half. The lab security door engages. The Geneset finish slaughtering the scientists and make a move on the door. They fire several shots before faltering, turning on each other, and blasting each other to scarps. Left with an uneasy feeling from the video logs, the crew steps into the lab. Pods full of horribly mutated H clones line the walls, each seemingly grafted with attributes from a different Pokemon. The body of the head scientist lies on the floor in the center of the room, a laser pistol by his head. Morgan walks to the body and examines it. “It looks like he… shot himself,” Morgan tells the others. “Whatever did all this must be in that room,” H says, pointing to a door on the far end of the lab. Alex glances over at the door and a feeling of dread overcomes her. “We should just leave,” she says. “Then what was the point of coming out here?” H asks. “We should find out what’s in there,” Dmitri says. He then walks toward the door. “I’ll go send a message back through the tram,” Shane says before exiting the room. The others wait anxiously in the lab, staring at the door, both terrified by and drawn to it. Once Shane returns, they gather around the door and prepare to enter it. Dmitri raises his hand to the console and presses the button. The door slides open, and they step inside. Fragments of glass from a shattered pod lie scattered across the floor. A horrible, twisted hybrid of a monster stands before them. It is an abomination. Dmitri can feel a powerful aura emanating from the creature; the same influence he felt behind Darkrai, the same one surrounding this station. Despite resisting this aura, Dmitri can’t help but feel shocked by the sight before him. Alex can do nothing more than stare in horror. Those terrible, disgusting experiments had lead to this… thing. What have they done? she asks herself. Unspeakable things had been done to both Pokemon and Humans to bring it into existence; an existence that truly terrifies her. Morgan also feels the fear; the fear that has been following her, the fear that she had finally been starting to get over. It’s just a Pokemon, she tells herself. However, she can’t help but be afraid. This is Mr. Silver’s plan. The thought sparks through Shane’s mind. This is what we were designed for. He feels disgusted. The Human morality now so intricately tied to his being is terrified that the seeds of life he sowed as the Gardener were meant to create a new generation of these abominations. H, on the other hand, is impressed. For a long time, he had tried, and failed, to combine the powers of Humans and Pokemon. “Such Brilliance!” he says aloud. “But fate has ruled that I never lose. I shall surpass this, and all-” His words are cut short as the air constricts around his throat, his feet lifted off the floor. The Pokemon’s eyes lock with his. On the night before this session, a thought popped into my head: Mewtwo. DragonStorm told me once about an idea for a sci-fi game involving Mew and Mewtwo. I think it was like a semester before we started Spacemon or sometime around then. I had always thought about it being the final thing but I didn’t make sense because he knew he told me about it. But then Saturday night it sort of popped back into my head and I was just like “maybe part of this is going to be included somehow.” Even then I sort of got the feeling that he would use Mewtwo since it’s one of his favorite Pokemon, even if it wasn’t in the same way he had told me about. But wow, the reveal was just so… perfect. If you don’t know what that quote is from, you’re doing something wrong. Let me set the scene for you. Humans and Pokemon were seeded throughout the Galaxy by the Gardener to begin the next cycle, to be harvested by Mr. Silver and formed into a new generation of Mewtwos. A new generation that will become the ancient civilization of the next cycle. And guess who has to fight them in Volume 3! We’re super fucked but we’ll find a way to win… somehow. So this was a completely combat-free session. It was quite interesting in that regard. And we ended with a mini space dungeon-equivalent. There was an explicit turn order for the dungeon exploration that felt a bit odd to me but it was still enjoyable. The atmosphere was just so creepy and tense and it all built up to a fantastic cliffhanger. I hope you enjoyed the suspenseful ride of Volume 2 as much as the rest of the gang and I did and I look forward to seeing you in the fall for Volume 3! If you want more Spacemon to hold you over until then, fear not, for I have Spacemon goodness planned for the break! Update: Before you begin reading Volume 3, it is highly recommended to read this mini-series written by the GM. Post-Chapter Challenge: It’s Mewtwo!! A whole ancient civilization of Mewtwos! I have no idea how the party is gonna handle them. No, seriously, I wasn’t able to think of a quest or item or anything that could plausibly work. How would you go about saving the galaxy from the Mewtwos?